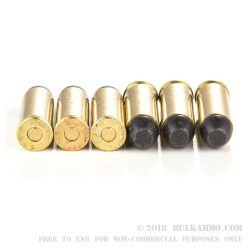 This is a 600 round case lot of 45 Long Colt ammunition from Czech producer Sellier & Bellot who offers a great option for the CAS (Cowboy Action) Shooters out there with this mildly recoiling, purpose-built lead-based load. 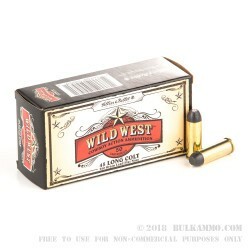 The 250 grain flat noised lead projectile is a great throwback to the wild west with the original looks and original load styling. The performance, while adequate for the functioning of most firearms, is very lightly loaded, to keep you on target and make your follow up faster in competition. Sellier & Bellot makes premium ammunition and they have a vast portfolio of ammunition that spans across the globe in caliber and usage. They offer some of the rarest production cartridges and seem to always have a caliber before it is hot. Their approach to ammunition shows a true commitment to furthering the endeavors of individual shooters throughout the world. Their reputation for producing top quality ammunition and offering potent solutions to hunting, law enforcement and general shooting needs makes them a clear market leader, especially when you look at their global footprint. 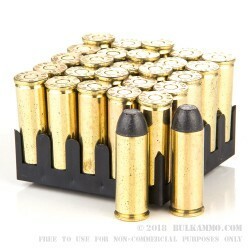 This is a brass cased Boxer primed round that can be reloaded, and the casing is top tier brass.